For much of the past 25 years, the industry has struggled to surpass a rate of 60% of carcasses grading Prime or Choice. That’s changed. Here’s a look at the impressive grading numbers. At the time, that seemed a significant accomplishment. The industry hadn’t achieved that type of performance since the early 70s. Meanwhile, the National Beef Quality Audits marked combined percentages at 55, 49, 51, 55 and 61 in ’91, ’95, ’00, ’05 and ’11, respectively. In other words, during the past 25 years, the industry has struggled to surpass a rate of 60% of carcasses grading Prime or Choice. However, during the past several years, the industry has made tremendous progress. To that end, the industry has easily surpassed the 75% threshold established back in 2015 and now achieved a new landmark: 80% of carcasses achieving the Choice or Prime designation in January. 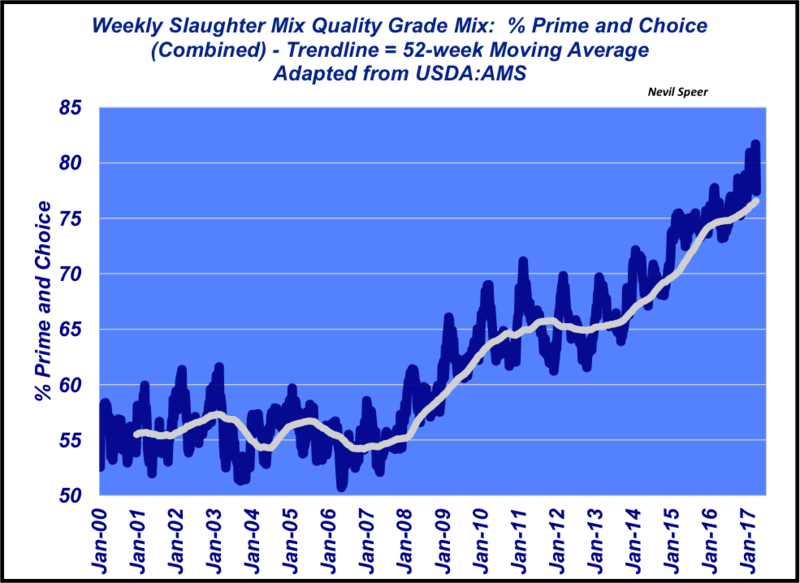 But better yet, in mid-March, nearly 8% of carcasses graded Prime, while 74% graded Choice for a combined 82% mark. Related: Are we filling the demand for quality beef today? That achievement is the result of a distinct commitment to incentivize the industry in delivering more high-quality cattle. That’s resulted in strategic changes with respect to both genetics and management systems. And all of that is beginning to pay real dividends for the industry. Undoubtedly, this has played an important role with respect to beef demand in recent years. How do you perceive this trend with respect to the industry? Will this trend continue to move higher in the coming years? What changes have you made in recent years that are potentially contributing to this favorable trend? Leave your thoughts in the comments section below.